To create the card, I started prepping my materials. I prepped my watercolor cardstock with my Anti Static Bag. 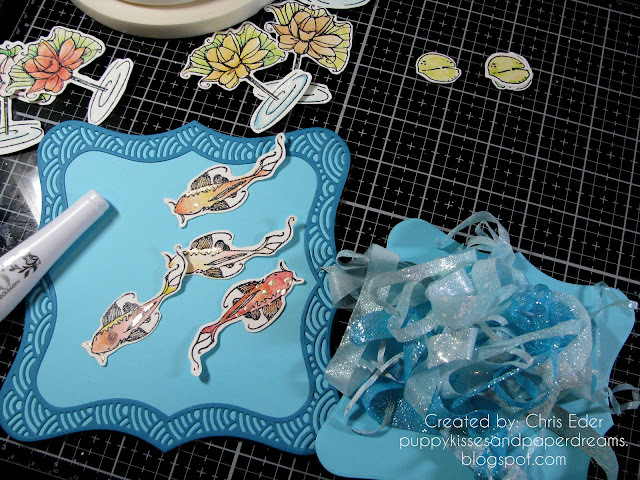 Then, I used the Tonic Tim Holtz Stamp Platform to stamp out the koi fish, leaves, and plants multiple times on watercolor cardstock, and Versafine Onyx Black ink. 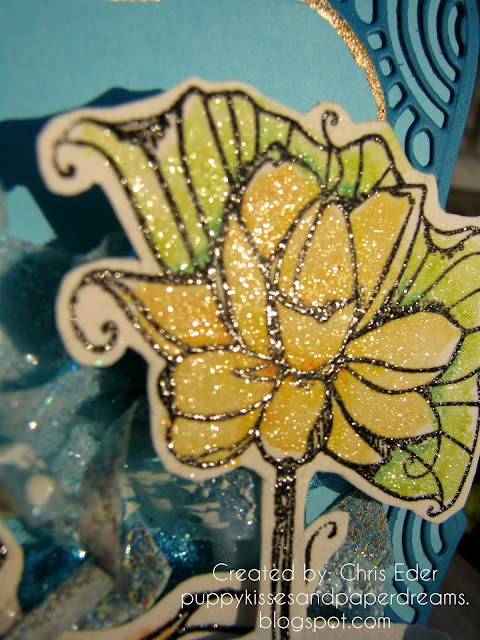 I sprinkled on Clear Detail embossing powder and heat set them. I colored them with the Nuvo Watercolor Pencils, in both the Hair & Skin Tones set and Brilliantly Vibrant set. I lightly colored the fish with the watercolor pencils, without filling in the whole area, then I used the Nuvo Aqua Shimmer Glitter Gloss Pen to move the watercolor pencil around. This gave it some shine and gradation! Then, I fussy cut out the koi, leaves, and plants. I also cut strips of 1/8", 1/4", and 1/2" Tear-ific Tape, about 8-12" long. Then, I adhered the glitters (Ocean, Waterfall) and embossing powders (Skylight, Caribbean, Robin's Egg) to the strips. 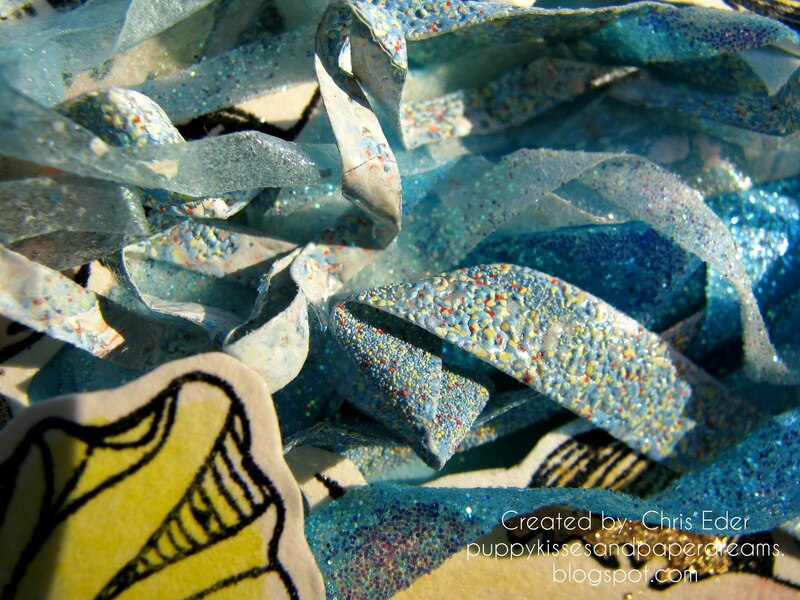 After covering one full side of each strip of Tear-ific Tape, I pulled off the release paper from the opposite side, and re-dredged the Tear-ific tape through my pile of glitter or embossing powder. 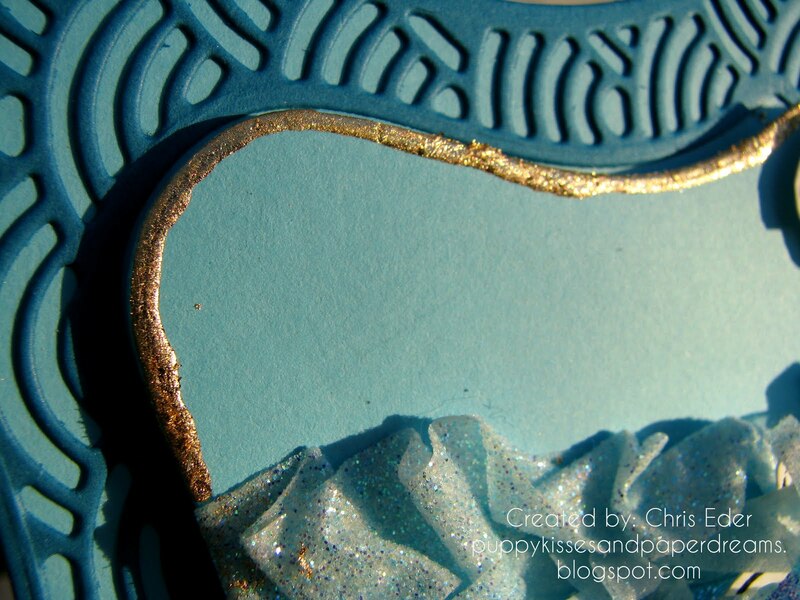 Once all the strips were covered, I heat set the embossing powder strips. I also ran some blue cardstock through my Tonic Tangerine and die cut out the die shapes with Tonic's Jasmine Sunset Layering Die Collection. Here are all the parts of the card, before I assembled everything. As I was building the card together, I ran the Nuvo Smooth Precision Glue Pen along the outer edge of one of my die cut panels. I let the glue dry to a tacky finish, then applied the Nuvo Radiant Gold Gilding Flakes. I rubbed in the flakes into the tacky adhesive, then brushed off the remainder with the Nuvo Mini Brush. This whisks away all the un-adhered gilding flakes. I adhered strips of the glittered and embossing powdered Tear-ific tape to the panel as well, and swirled all these colors together to make the card look like swirling water. Koi tend to swarm and they swirl all around one another trying to get in the best position. I tried to recreate that swirling frenzy! 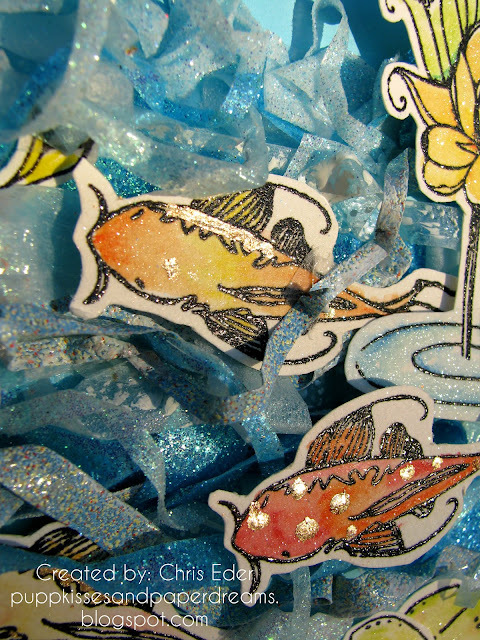 I put the fish at different levels and layers inside the swirling tear-ific tape waves. Here is another shot of one of the plants, which really shows the amazing shimmer from the Nuvo Aqua Shimmer Glitter Gloss! This card is super sparkly in person! I also added a bit of Nuvo Smooth Precision Glue Pen in random spots on each koi fish, and after it was tacky, I adhered more Nuvo Radiant Gold Gilding Flakes. 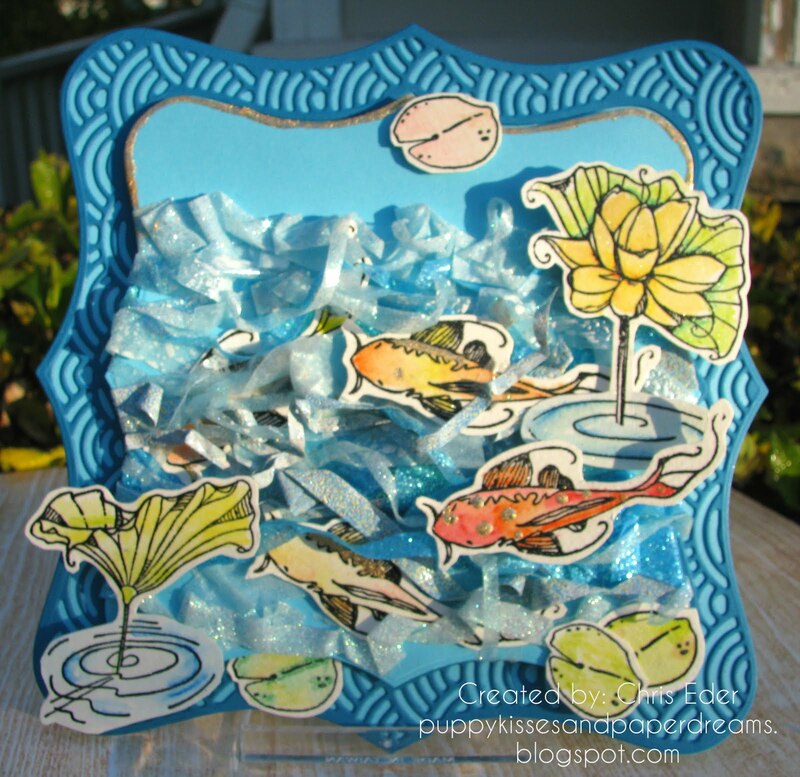 This gave the fish just a little extra pizzazz.